Two brand new pilot studies have recently been conducted to compare the efficiency of a Water Flosser to interdental brush use on bleeding and plaque scores. The studies were conducted at an independent research facility and are the first to compare a Water Flosser to an interdental brush. 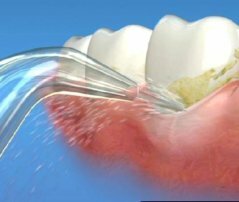 The Water Flosser was significantly more effective at removing plaque after a single use and at reducing gingival bleeding at two weeks. To date the Water Flosser has been shown to be more effective in removing plaque and reducing gingival inflammation than string floss, air floss and now interdental brushes. Subjects were instructed to brush twice a day and use their assigned interdental cleaning device once in the evening. Gingival health was evaluated by measuring bleeding on probing at 6-sites per tooth. Plaque removal was measured using the Rustogi Modification of the Navy Plaque Index. 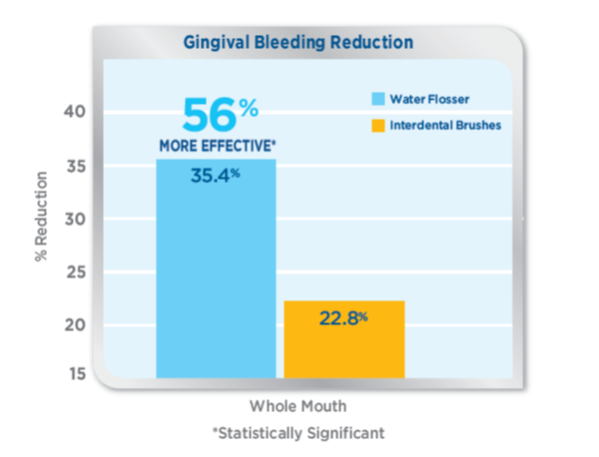 The Water Flosser was 56% more effective for reducing bleeding than interdental brushes for whole mouth bleeding and 53% more effective for interproximal sites only. The Water Flosser also significantly reduced plaque from baseline measurements. The Waterpik® Water Flosser is effective for removing plaque from hard-to-reach areas and is significantly more effective than interdental brushes for improving gingival health. Subjects brushed as they normally do and used their interdental device to clean their whole mouth once under supervision. They were then evaluated for plaque removal. The Water Flosser was 18% more effective at removing plaque overall compared to the interdental brushes. The Water Flosser was also 20% more effective at removing plaque from interproximal areas compared to the interdental brushes. The Waterpik® Water Flosser removes significantly more plaque from tooth surfaces than interdental brushes.